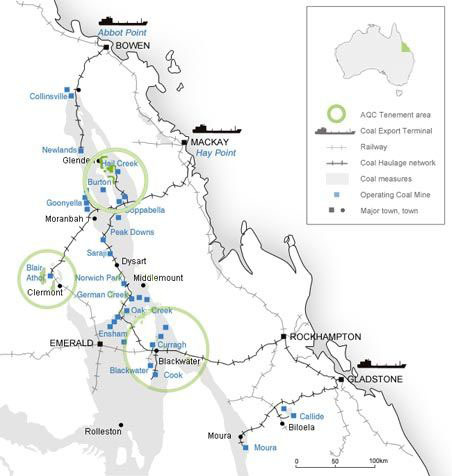 Australian Pacific Coal Limited (AQC) is an Australian public company focusing on acquiring, developing and value adding thermal and metallurgical coal prospects. The Company's Queensland portfolio consists of 11 coal tenements comprising seven 100% owned exploration permits (EPCs), one mineral development licence (MDL) and three joint venture exploration permits. The Blair Athol project comprises one granted EPC over an area to the south of Blair Athol, one of the Bowen basin's largest open cut coal operations. The application area targets extensions to the Blair Athol basin looking for further shallow thermal coal truncated from the main deposit. The Blackwood Resources Joint Venture consists of three EPC's in joint venture with the unlisted coal explorer, Blackwood Resources Pty Ltd This joint venture was created in April 2010, leaving AQC with a 10% free carried interest up to feasibility study stage. AQC owns an industrial minerals projects in central western Queensland. The project forms part of AQC's former industrial minerals business and is no longer part of the Company's core business. Options are currently being assessed to divest this asset. AQC has acquired a number of coal exploration licences with potential for all thermal and metallurgical coal. These projects are currently being assessed for historical information and geologically modelled for exploration prospectivity.